Looking to tie the knot in the ‘Silicon Valley of India’? There is something perfectly lovely to get married in your hometown and if Yelahanka is where you live you’re blessed with all kinds of wedding venue to fit any budget and type of celebration. This beautiful locality in North Bangalore is filled to the brim with attractive, elegant and unusual wedding venues, but it can be challenging to make that final decision without a good filter. We’ve selected these 5 unique and chic banquet halls in Yelahanka, which are as eclectic as the brides and grooms to whom we aspire to appeal. Dive into our list and find that perfect spot for your wedding! Bangalore’s most elegant property, Hotel Sai Leela offers the best banquet halls in Yelahanka. Whether it’s a small gathering function or a big fat Indian wedding on your mind, this venue has a variety of banqueting spaces to fit your needs. You can either choose their classic indoor facilities or plush green lawns to host your grand celebration. Hotel Sai Leela has fully trained and committed staff who beautifully manages any and all events. You can rely on their management team to provide you with the best decor, cuisines and concierge service. The venue does not allow outside caterers and alcohol on the premises, but lets you arrange your own decorator and entertainment. One of the largest wedding venues in North Bangalore, Royal Orchid Resort & Convention Centre is spread over 8 acres of greens. The venue consists of small banquet halls to prestigious grand ballrooms that are perfect to host a majestic Indian wedding. Whether you have 250 or 3500 guests attending your big day celebration, this wedding venue can comfortably accommodate all and doesn’t fail to provide exceptional service. Royal Orchid has an in-house decoration team who design the space beautifully, so you needn’t worry about setting the right mood for the celebration. The venue allows you to book your own caterer, DJ and organize your own alcohol or avail the services provided by them. Offering over 18,000 sq. ft. capacity, Elaan Convention Center is one of the largest and the most gorgeous banquet halls in Yelahanka, Bangalore. This venue is especially created for big fat Indian weddings. The space is provided attached with an additional 4,000 sq. ft. dining room and pre-function area of the lawns. Equipped with the latest technology, this wedding venue has got your entertainment needs covered. The venue has an in-house decor team looking after the design of the banquet. At Elaan Convention Center, outside caterers and DJ are allowed. Alcohol consumption is not permitted on the premises. Flagship hotel of the MRG Group, Goldfinch Bengaluru is ideal for couples wanting to host a luxurious wedding celebration. 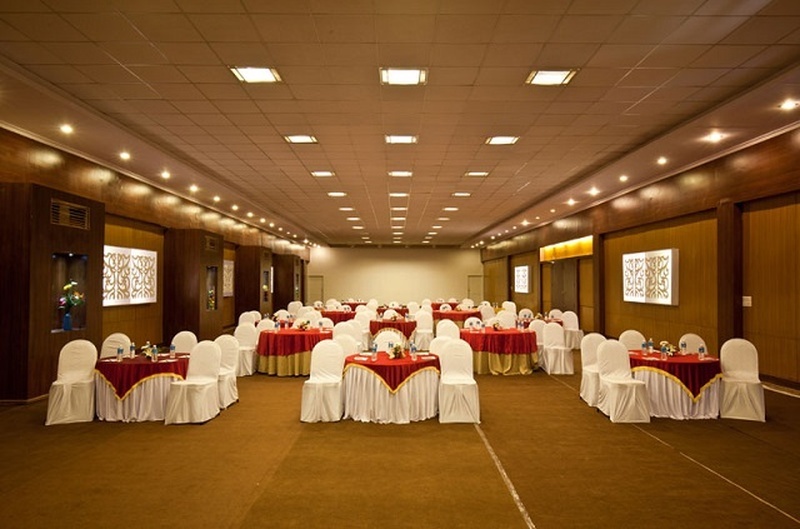 Perfect for small to medium-sized gathering, this venue offers the most stylish banquet halls in Yelahanka, Bangalore. Choose from their 2 gorgeous banquet spaces or take your celebration outdoors by picking their serene poolside or lawn area. Though robust culinary is provided in-house, the venue allows you to book your own caterer, as well as decorator and DJ. Outside alcohol is not permitted on the premises, but served in-house. Spread across 5.5 acres of verdant surroundings, Country Club is an ideal choice for couples wanting to throw grand celebration combined with leisure. Along with offering one of the best banquet halls in Yelahanka and a plush green lawn for outdoor functions, the club offers wide-ranging leisure hospitality amenities perfect to help your guests unwind. As a full-service provider, the club takes care of all your wedding related services, including decoration, catering and entertainment facilities. The venue has got you covered. If you wish to book your own DJ, the venue allows with royalty charges applicable. How to get there: Bangalore 67/A, Sathanur Village Yelahanka, Hobli Bangalore (North) – 560 064. Looking for more options? Check this out! >Banquet Halls in and Around Sarjapur Road Bangalore That Are Absolute Stunners!